Opulent yarns hand dyed in rich colourways. Addi needles and clover accessories. 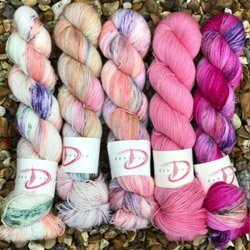 Silk yarns both embellished and straight hand dyed to Debonnaire specifications. Simple and elegant patterns designed for all Debonnaire yarns. Lang Mille Colori yarns.